3/17/98 NEW! CONFIRMED - Frozen maxi-single commercial release. 3/13/98 NEW! CONFIRMED - Madonna visits The Rosie O'Donnell Show to perform and chat it up with her good pal Ro. 3/6/98 NEW! CONFIRMED - Madonna to visit Canada for Ray Of Light album promo activities and personal appearances. More information to follow as dates are set. 3/3/98 NEW! 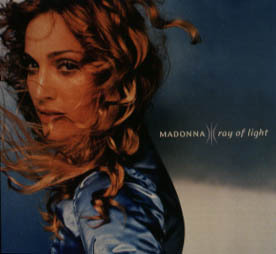 CONFIRMED - Worldwide Ray Of Light album commercial release (except Japan). Domestic Frozen single commercial release. Ray Of Light album in special limited edition package will also be available. 2/28/98 - 3/1/98 NEW! MTV - All Madonna Music Weekend! On the last day of this Madonna extravaganza, MTV's Ultrasound, the new weekly music series that provides the viewer with exclusive, behind-the-scenes access to the artists that shape the music industry, will present an exclusive interview with Madonna during the making of her new album, Ray Of Light. This Madonna episode airs in the U.S. on Sunday, March 1st at 10:00 pm (ET/PT). It features a relaxed Madonna speaking candidly with MTV News anchor Kurt Loder on the set of the Frozen video and in the recording studio. She chats about motherhood, her recent embracement of spirituality, and the inspiration behind her much-anticipated new album release. There's also bonus footage of baby Lourdes dancing to The Macarena. Kurt also conducts interviews with collaborators, William �rbit, who produced Ray Of Light with Madonna, and Chris Cunningham, the director of the Frozen video. We�ll post International MTV Ultrasound airdates of this Madonna episode as they are confirmed. 2/17/98 - 3/3/98 NEW! CONFIRMED - European Ray Of Light album promo tour will have Madonna visiting London, Paris, Sanremo, Madrid and Duisberg, Germany among other cities yet to be determined. Appearance dates slated so far: 2/21 - Live performance in London, England on the BBC National Lottery show. 2/24 - Live performance in Sanremo, Italy at the famous Italian Festival di Sanremo. 2/27 - Live performance in Paris, France on TF1 channel TV show, les annees tubes. 2/28 - Live performance in Ravensburg, Germany on popular Saturday night variety television show, Wetten Das. More dates to follow. Keep an eye on your local news for further information and confirmations on appearance dates in your area. 2/14/98 NEW! Yes, Madonna will schedule a few live club dates performing songs from her new album on and around this very date, but it's not 100% confirmed yet where and what time... Stay tuned.� NEW! Deepak Chopra's album of poetry titled The Gift of Love was originally scheduled to be released today, but is now pushed back to a March release date. Madonna contributed the reading of a Rumi poem entitled Bittersweet which was translated by Deepak Chopra. Please check back for a confirmed release date for this album. 2/13/98 NEW! CONFIRMED - Frozen single release to domestic radio. We respectfully request that everyone in M's domestic�fan base call into their local radio stations to request Frozen. 1/27/98 - 1/28/98 NEW! Madonna and Ray Of Light album International Press, Radio & TV Days in Los Angeles. NEW!! 5/2/98 Madonna's new single, Frozen, has shot to the Number. 2 spot on Australian radio's top 30. These charts are based on most requested songs. **If you have any similar chart action available(from your home country), I will gladly post it right here. Just e-mail me the info. Cheers! Qmagazine Photo shoot: Photo's taken from the latest issue of Qmagazine, feturing Madonna on the cover. !EXCLUSIVE! MADONNA INTERVIEW: Latest Madonna interview--exclusive 2 this site! Other Gossip! : Madonna related news--Updated Daily!! Ray Of Light Pictures: Pictures 2 make your eyes bleed with excitment!! !